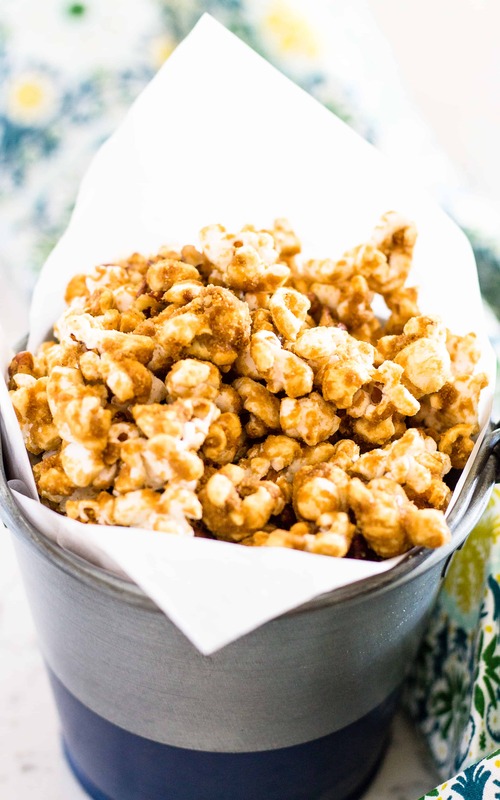 This sweet and salty classic caramel corn recipe will bring you back to childhood! Made without corn syrup and customizable to your liking will make this a time-honored treat for all generations! Who remembers eating Cracker Jacks as a kid? Maybe I’m too old, or couldn’t stand the cheap toys in the box, but I’m more of a Fiddle Faddle girl. I think it might be because there is about 237% (purely guesstimating) more caramel and gooey goodness on their popcorn than on Cracker Jacks popcorn. The more coating the better! I can also Hoover an entire bag of Poppycock when the mood strikes me. I love caramel corn, maybe because I love anything with caramel almost as much as I love anything that tastes like bananas! Caramel covered popcorn? It’s like a gift directly from Heaven! My mom makes the best caramel corn I have ever tasted. Crispy and sweet and I love eating it until I get a stomach ache or get it stuck between each and every one of my teeth. The only thing that could possibly make her recipe even better would be some sea salt. Salted caramel is all the rage so why not on popcorn? Here is the recipe that my mom (grandma to my kids) makes every Thanksgiving, when I make my Chocolate Chip Cookies, and gives out to our family and friends at the annual family reunion as party favors. I hope you will shove it in your mouth as fast as everyone else does. Just be sure to keep some floss handy! Can you make caramel corn without corn syrup? First off, I love making candy and treats but without as much weird stuff as possible. I know sugar is supposedly bad for you, addicting, etc., but a little every now and then isn’t going to hurt right? Moderation, people! 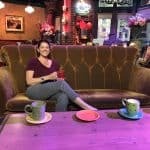 If you have been reading for a while you will know I am all about enjoying great food, killer cocktails, and sweet desserts just in smaller portions. If you make things right you only need a little bit anyway. So with this in mind, I make this caramel corn without corn syrup. 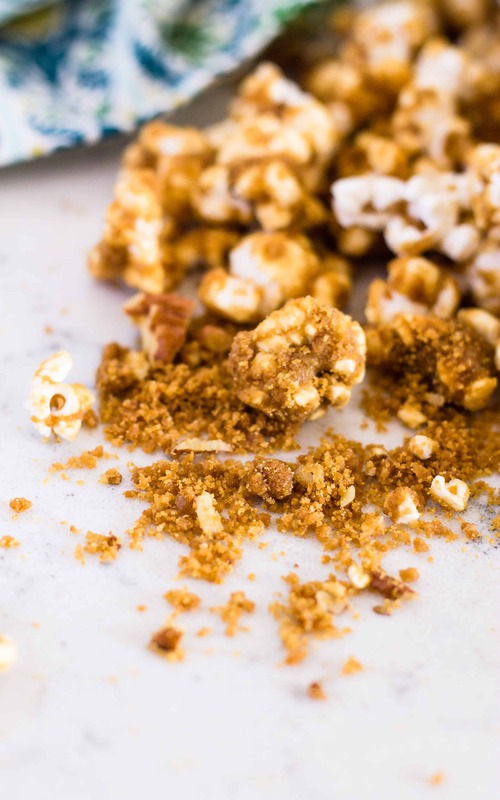 The trick is to bake it afterward to get the sweet caramel coating to dry onto the popcorn so you can store it and eat it without a sticky mess on your hands. Plus, baking it gives you an extra treat that I will share with you a little later. This recipe for making caramel corn is simple, only takes a few minutes of hands-on time, and makes a LOT of it so you only have to make one batch a week. Unless you have growing kids or a killer sweet tooth and then you might have to make 2 batches. Just get organized first so the process flows smoothly and you will have caramel corn without a destroyed kitchen in no time. Let’s get more in-depth on each step. I prefer to air pop my popcorn because it doesn’t require oil but feel free to use the oil method like in my German Chocolate Popcorn. Just pop it ahead of time and then clean that pot off the stove for more working space. You might need that large pot for stirring later so make sure it is clean. You can also pop your popcorn in a brown bag in the microwave without the oil but the bags will be small and since this recipe uses 16 cups it might take a while, and a lot of brown bags. Spray your baking sheet with nonstick spray or line it with nonstick foil. If you want to use foil that is nonstick already you need to spray it too. The caramel is sticky and you don’t want to spend the day peeling tiny bits of foil off your popcorn. You can also use a silicone baking sheet that doesn’t require spray. Just make sure that your pan is large enough to hold all the popcorn at once. If you need two pans to bake it all then you will need 2 silicone pads. Gather all your caramel ingredients close by. Have things already measure out. This step happens quickly and you don’t want to have to search for something last minute while your sugar is burning or already starting to harden and stuck in the pot. Don’t forget to have your spatulas ready too! I use my entire counter when I make this caramel corn recipe. Having my baking pans ready to go, a spot to set my hot pot of caramel on the counter (with a trivet or towel if your counters are not heat-safe) and a spot for my mixing bowl too. You can’t pour this hot caramel mixture into a plastic bowl so make sure you have metal or glass. Once you pour the caramel coating on the popcorn it starts to harden fast so you want a bowl large enough to hold the popcorn and caramel but also enough room to stir it without it falling over the sides and onto the floor or worse, your bare leg. Hot sugar and bare skin are a no-no! I use my large dutch oven to stir because it is large enough to spread out my popcorn a bit and stir without losing any. The more the popcorn is spread out the more you can pour the caramel evenly and not in one spot and then try to spread it to all the popcorn. Feel free to use what bowls or pots you have on hand. I would also spray these with nonstick spray too. If you are adding nut or seeds now is the time to do it. If you want the nuts to have caramel on them and to have the nuts stick to the popcorn and not fall to the bottom of the pot you need to add them while the caramel is still melted so have them ready to go now. I use toasted nuts for more flavor. Have a timer handy. You need to bake the popcorn for an hour but stirring every 15 minutes so one side doesn’t burn. If you are forgetful like me you need a timer. I set my oven timer for the full hour and a separate one for the 15-minute intervals. One time I just set it every 15 minutes but then forgot which interval I was on and burned it. My only tip for customizing your caramel corn is to know WHEN to add your add-ins. Anything that will melt, AND that you don’t want to melt, add in once the caramel corn has been baked. All chocolate items get added in once the caramel corn has completely cooled or you will have a monumental mess on your hands. All nuts and seeds etc get added in when the caramel is drizzled so they too can get the sweet and crispy coating on them. Check out this Candy Bar Popcorn from Hostess at Heart and this Crack Corn from An Affair from the Heart if you are looking for more ideas! The crispy caramel crunchies at the bottom of the pan. These crunchies fall off the corn as you stir it on the 15-minute intervals and can accumulate in the corners of your baking pan. This last batch I made gave me 3 tablespoons of crunchies that I promptly sealed in a bag and hid from the rest of the family! I tend to get a little more when I stir my caramel corn in my dutch oven between intervals. If I try and stir it on the baking sheets it falls onto the bottom of the oven. E-GAD! At the 15 minute marks, I remove my baking sheet, scrape the popcorn back into my dutch oven that I originally stirred the corn in and mix it thoroughly. Then I spread it back onto the baking sheet for the next round. I also scrape these crunchies back onto the baking sheet so they get the full hour of baking as well. 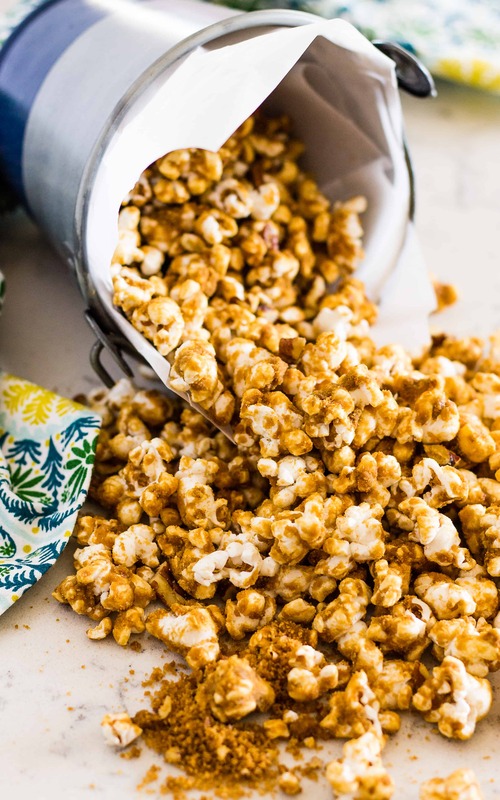 I hope you like this recipe for my mom’s caramel corn and that my baking tips are helpful to you when crafting your own caramel corn concoction! Make sure you make a few extra batches for when company comes to town. It also makes great hostess gifts for holiday parties and the teachers love it for their classroom! This recipe for traditional caramel corn will bring you back to baseball games and Cracker Jacks. This snack may not include the prizes in the box but you will love it just the same! 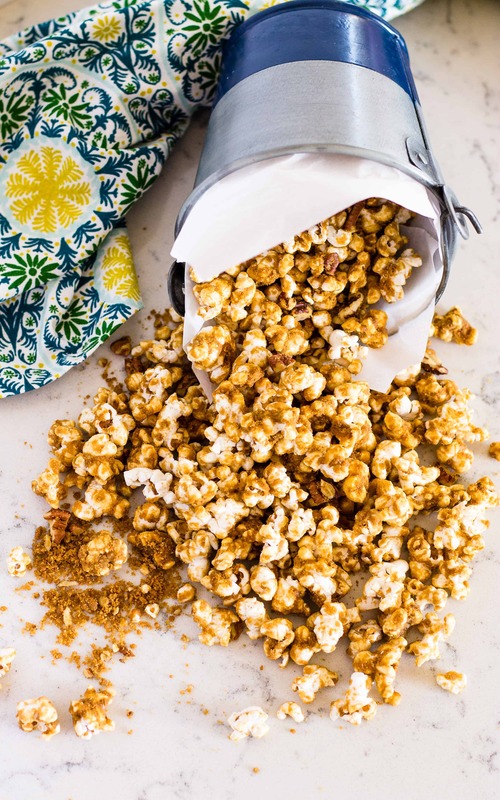 This sweet and salty classic caramel corn recipe will bring you back to childhood! Made without corn syrup and customizable to your liking! Pop your popcorn. You can use the oil or air pop method just don’t use the pre-packaged microwave kind. Prepare your baking pan with nonstick spray. In a medium saucepan combine the butter and brown sugar. Melt over medium-high heat until the butter is melted and the brown sugar is dissolving. Add the baking soda and stir carefully. THIS WILL CAUSE IT TO FOAM AND BUBBLE so make sure your pot is big enough to handle that. Quickly drizzle the caramel mixture over your popcorn. Stir to coat all the popcorn as evenly as possible. Pour the popcorn onto the prepared baking sheet. Thanks for paying homage to our family traditions at Thanksgiving with the caramel corn and chocolate chip cookies. Just reminded me I need to get started with making the family favs as there are only a few days left to get them done. Thanks for the memories! Mom/Grandma!!! I love caramel corn! I’ve been wanting to make it for so long, I can’t wait to give this recipe a go! I’m a fan of giving food as gifts, especially homemade treats. I thought I would need a candy thermometer to make carmel corn. Can’t wait make this! Those crispy treats once its baked? Youre killing me with deliciousness! … I couldn’t stay out of this! Definitely a keeper! If I had to pick a food I would never give up, it would be popcorn. I love it so much!! This sweet and salty combo you have going on here is making my stomach growl! Cracker Jacks was a childhood favorite of mine. Your salted caramel corn recipe looks like an even better adult version! Thanks for this great snack idea, we look forward to trying it! Love this! 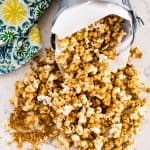 Your trick to making this caramel corn without corn syrup is so smart~ I know my boys are going to love this!